How do they verify their income to qualify for assistance? We verify clients’ identification documents and request copies of pay stubs, bank statements, or financial assistance award letters to determine income level. What qualifies as low income? Depending on the family size and structure, we use the figures supplied by the US government for determining income category. Our clients are in the extremely low income, very low income, and low income level range in the vast majority of situations. How often do clients come for service? Clients residing in a home come every two weeks and receive enough food for their family for approximately 5 days. Clients who are homeless come every week and receive enough food for approximately 3 days. Clients are asked to verify their address or living arrangements each time they come for service. How many clients does Tracy Interfaith serve? Average number of clients/family members served, as reported in interviews, ranges between 2300-2500 per month. Average number of meals that can be prepared through food distributed is 53,000-69,000 per month. Do clients pay for any services? All services by Tracy Interfaith Ministries are free to our registered clients. That includes food, clothing, household items, occasional emergency rent or utility assistance. What help do clients receive at Back to School, Thanksgiving and Christmas? Clients may pick up a new backpack with school supplies for their school-aged children before school starts in July/August. Clients may sign up to receive a Thanksgiving dinner box of food including a turkey or chicken. They may sign up at TIM for Brighter Christmas or may sign up at TIM for a Christmas dinner box including toys for children. (Brighter Christmas and TIM coordinate efforts so they do not duplicate service). How do you sign up to volunteer? Visit our volunteer page. When you come to volunteer for the first time at TIM you will sign in with name, address, phone number. There will be other paperwork if you need to track hours for verification to another entity. You will log in and log out each day. For some positions volunteering on a regularly scheduled day is preferred, for other positions a schedule based on your availability is acceptable. Can students and others get service hours at TIM? Yes, we have many students and community members of all ages volunteering to gather service hours at TIM. If they are under age 14 years of age, an adult must accompany them as they work. If they are between ages 14 -18 years, they may stay and work providing appropriate paperwork including waivers are filled out by parents. If a report needs to be turned in to verify hours served, that can be recorded and tracked with a time sheet and forms signed by TIM supervisors. Are there any paid staff at TIM? There are no salaries paid by Tracy Interfaith Ministries. We are 100% volunteer staffed. There are other organizations and companies that pay wages to those who log hours at TIM. That is arranged through those companies at no cost to Tracy Interfaith Ministries. Can volunteers take items that they see at TIM? Items donated to TIM are donated with the intent that they are for the benefit of clients. Volunteers may not take items that are donated. There may be overstock of bread/pastries or other items and those items may be made available occasionally to volunteers by an announcement for that day only. What special projects do you have that need extra volunteers? What are your greatest needs? There is always a need for volunteers. See our volunteers page for more information. You can also visit JustServe.org for Tracy Interfaith Listings. Simply type “Tracy, CA” into the search bar on the home page. There is always a need for financial support to purchase the food that has not been donated. There is always a need for donated food (unexpired food and produce). There is always a need for blankets, towels, clothing, coats, backpacks, fans, heaters. Visit Our Needs for a full list of items. Are there items you cannot accept? We cannot accept furniture, large appliances, electronics (computers, printers, TVs, telephones). We cannot accept car seats, cribs, mattresses. What do you do with items that you cannot use? We are able to donate items that we cannot use to Salvation Army (they pick up items weekly). We sell some new/commercially donated items via auction or sales to receive money to purchase food and necessities for clients. Can we get a receipt for our donations? Yes, when you donate items you may request a receipt that shows the amount of items donated. We do not assess the monetary value of the donated goods but show the quantity. For cash donations visit our donation page. 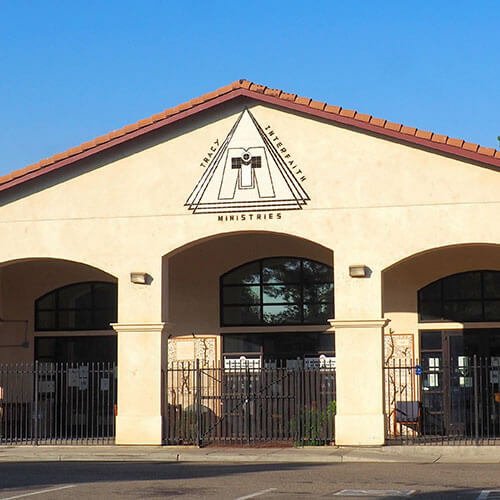 Tracy Interfaith Ministries is a Tax Exempt 501(c)(3) organization. Tax ID # is 943150638.